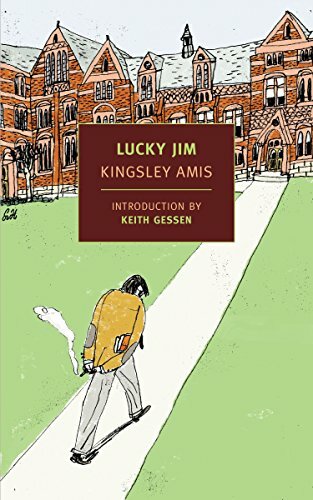 As I read the first couple of chapters of this dryly, bitterly, funny novel by Kingsley Amis, I was afraid it was going to be too much like a Barbara Pym novel: some sly observational humor that's crushed under the weight of a little too much depressing postwar English ennui. But around the third chapter I began to enjoy myself. Jim Dixon, a newly hired history lecturer in a small provincial university, hates his job and his colleagues so much that he is unable to resist sabotaging his career prospects at every turn. This makes for lots of comic fun. The cynicism never overpowers, though, as it's balanced by Jim's occasional fits of self-honesty which keep him trying, for instance, to do right by the two women with whom he becomes involved. Great fun. Oh my goodness, that's the perfect description of Barbara Pym. I just read Excellent Women, which is billed as a comedy but it's pretty hard to see. If Lucky Jim is *not* like Pym, I'm all for it. Can I quote you when I write my review of the Pym book? Oh, absolutely, feel free. I read Excellent Women sometime last year, and was really expecting it to be funnier, as you say. But I think you'd like Lucky Jim much better--it's sort of wicked fun, and I laughed out loud more than once. Sparks my interest....Kingsley Amis. Any particular reason for chosing this author? You don't read many reviews about his books. I didn't really choose this author--I came across the book in the back room of the library's used book section. I had never heard of it, or of Kingsley Amis. The book looked appealing though, and the cover blurb called it extremely funny, so I picked it up for 50 cents. :) That was a year or so ago. Reviewers on Amazon say that Amis' other books are less light and funny than this one, though, so I'm not sure whether I'll look for more from him. Will you please consider reviewing my new novel DON’T FORGET ME, BRO (Stephen F. Austin State University Press and Texas Book Consortium, Dec. 2014-Jan.2015). My novel tackles themes of childhood abuse, mental illness, and alienated families--and leaves the reader uplifted! Kirkus Reviews says: "Read this book for the vivid imagery and sharp dialogue. Read it for the spot-on characterizations..."
The subject matter is never treated frivolously or over-handled in details. The writing is taut and compelling throughout. The pace leans forward tirelessly. Those accomplishments alone took years. In all, five of my thirty years of writing were dedicated to this novel. I like to joke: I had to pull my soul sideways through a keyhole for those five years to get the right words down. have been nominated for The Pushcart Prize. My short story "The Scratchboard Project" received an honorable mention in The Best American Short Stories 2007. But DON'T FORGET ME, BRO is my best! The novel is a fictionalized story of my brother. Joe died at 47 of system-wide neglect and indifference for the so-called mentally ill in my, until recently, extremely backward home state of West Virginia. I know thousands of lives are lost every day around the world. True, Joe was just one. But in this novel, you will see him live and die not once, but a thousand times in the minutes of his life. If you email me at johnmcummings@aol.com, I'll send you the cover graphic for my novel. Then, please take a look at the image. You will see in Joe's innocent, dead-on eyes at 19. I'll also email you a new digital .pdf of my novel from the publisher. It's a clear, bold text. sensitive to the reader's well-being and tolerance. I say this about my work. So I say so now with a truth I can all but guarantee. I hope I don't sound arrogant. I am just very happy and confident. To give you a bigger picture of my novel, I'll even email you a full advance review by Pauline Finch of Bookreporter.com, along with a list of authors who've blurbed my novel so far and what they have said. I would very grateful and honored if you were to review my new novel. My phone number is (304) 620-8747.